Create your Dream DayWhether you're planning an intimate party with friends and family, or a larger more traditional celebration, Hitchin Priory will have the perfect Wedding Package for you! From civil ceremonies to wedding parties, Hitchin Priory offers an array of options available for your special day. Take your vows al fresco! From June 2019 Hitchin Priory will have an outdoor wedding licence for civil ceremonies so if you’re dreaming of an outdoor “I do”, Hitchin Priory is the wedding venue for you. 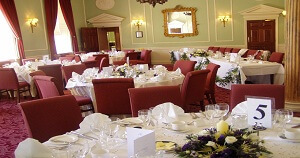 Your wedding is unique and your special day at Hitchin Priory will be tailored to suit your individual needs for catering, beverages and entertainment. There is a minimum adult guest number requirement of 40 guests – Thursday and Sunday, 50 guests – Friday and 60 guests – Saturday. To help you create your dream wedding day, our wedding co-ordinator will be happy to discuss your requirements and help you create a memorable day you’ll cherish forever. Click on the links on the right, to download our standard packages and menus. To discuss your requirements in further detail, our wedding planning team will be happy to help. Call us on 01462 420500. Hitchin Priory is a charming 14th Century building, set in 19 acres of magnificent gardens and parkland nestling on the River Hiz. One of the most charming wedding venues in Hertfordshire. Breath-taking views across 19 acres of parkland, which provide a magnificent backdrop for your perfect wedding day. Come and take a look! We have two more wedding fayres arranged for 2019, the next one is on Thursday 4th July and the last one on Sunday 22nd September. There’ll be a pop-up bridal shop where you can try on the dress of your dreams. Build relationships with over 30 local quality exhibitors and our wedding coordinator who will be available to discuss your wedding plans and show you around this magnificent wedding venue.